Old cookbooks often contain recipes with names that memorialize someone, but provide almost no clue about the food. For example, I’ve seen recipes for Grandma’s Cake and Mrs. Johnson’s Dessert. I usually shy away from these recipes because of the unhelpful title – but I recently made an exception. 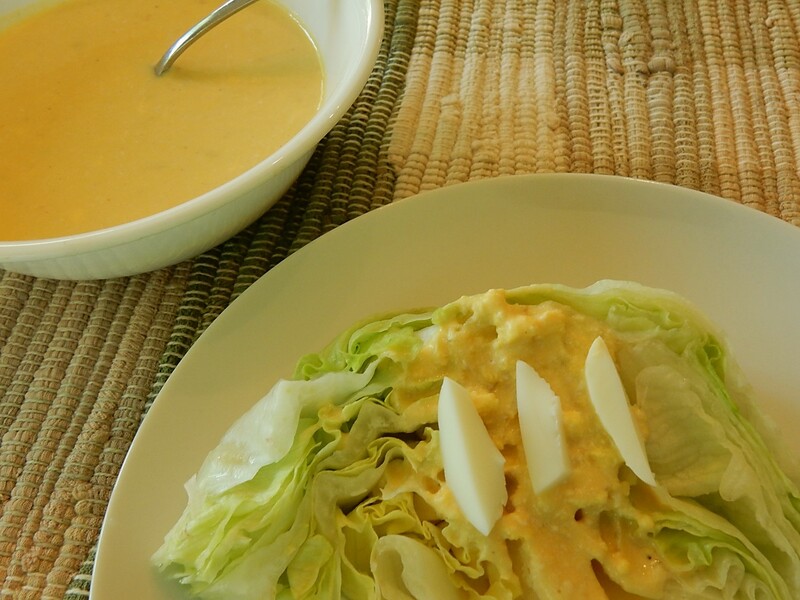 I decided to give “Mother’s” Salad Dressing a try, and I’m glad I did This tangy, creamy, old-fashioned milk, vinegar, and egg dressing was delightful. Cut hard-boiled eggs in half and remove yolks; mash yolks with a fork until fine. Set aside. Put evaporated milk in a small bowl; slowly add vinegar while stirring. Add mashed egg yolks, sugar, salt, and pepper; stir until combined. Serve with lettuce or cabbage. If desired garnish with pieces or rings of the egg whites. I only used half as much salt as called for in the old recipe. One teaspoon seemed like it would make the dressing too salty. Posted on June 24, 2018 June 23, 2018 by SherylPosted in FoodTagged recipe, salad dressing. This was the very best dressing for home grown leaf lettuce! My aunts and grandmother used this recipe so the name seems apropos. I’ve had a guest or two request the recipe after I’ve served it, too—a creamy, sweet and sour. I may need to try this. I remember hearing years ago of “boiled” salad dressings, especially for “cabbage salad,” which is how cole slaw was known in NE PA. I have my grandmother’s dressing for cole slaw, but the eggs are cooked in it, not hard boiled. We don’t have a name…just Nanie’s. I agree! I suppose that they weren’t aware that it wasn’t very healthy to use lots of salt; but, in my opinion, excessive salt doesn’t even taste good, so I’m a little befuddled by the amount of salt that old recipes sometimes call for. I’ve printed it out, thanks, Sheryl. It’s tasty! I think that you’ll enjoy it. I’ve never used evaporated milk in a salad dressing. Glad to know it’s so versatile! I was intrigued by the use of evaporated milk in this recipe. I wondered if evaporated milk was considered “modern” at the time. It’s a little thicker than regular milk, but it seems cream might be another option. Very healthy and it does sound very good! Have to give it a try. My oldest grandson doesn’t like egg yolks, so I can feed him the whites! Sounds like a good plan. I ended up with some extra egg white pieces when I made this. I know this recipe! We cal it “Grandma’s lettuce salad” and it was made by my husband’s Grandma. How wonderful. Taped to the inside of my kitchen cupboard is a stained index card labeled “Pappaw Watts’ Homemade Ketchup.” Which reminds me, it’s time to make again! As a kid I reached for the Heinz, but now the taste of the homemade ketchup brings back memories of sitting at my grandparents’ formica table top with all the side dishes they always offered up. You comment about homemade ketchup brought back childhood memories of a neighbor who would give us a jar of homemade ketchup each summer – and I never liked it. My mother, on the other hand, always said that the homemade ketchup tasted the way ketchup was supposed to taste- whereas commercially-made ketchup tasted burnt. I love hard boiled eggs in salad–but I’ve never seen a recipe that incorporates the yolk in the dressing! Very intriguing! Good as Gold 🙂 Thank you for sharing! Oddly enough this recipe seems familiar to me. My mother was a cook extraordinaire and she made all sorts of recipes, sometimes only once or twice. I swear she made something like this. I’m going to give this recipe a go, for many reasons. Thanks. I like the random recipes with names best, kind of. They invoke more of a sense of the actual people’s tastes.